Founded in 2002 in Barcelona, Spain, Digital Samba is a leading web conferencing software provider. They have offices in Germany, the USA and India. This review will focus on their OnSync service. 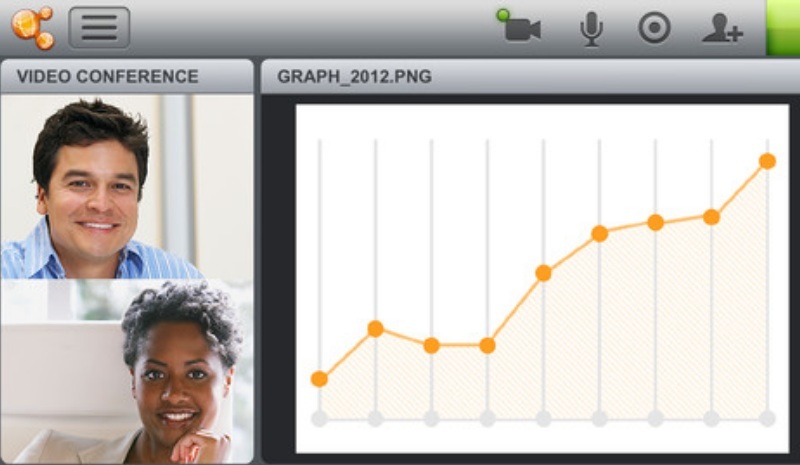 This is an enterprise browser and mobile all-in-one white-labeled web conferencing solution. This solution is rich in features and supreme security, making it suitable across the board from home users to enterprises. This service is available across multiple platforms including for Internet Explorer 7, Firefox 3, Safari 4, Chrome 4 and later on Windows, Mac, Linux and Solaris. OnSync also works on desktops and mobile phones. With no installation or download, OnSync is up-and-running in minutes. But what makes this service so easy to use is the intelligence of the software. The platform learns a user’s feature preferences based on their activity from its first use, and from then on highlights key features according to the user’s behavior. The dashboard is extremely streamlined and innovatively designed for a smooth and enjoyable experience. Participant lists and access management ensures users are in the driving seat over who they connect to and how. OnSync also offers Enterprise Server licenses that can either be hosted by Digital Samba or by the customer. OnSync is one of few platforms that offer on premise enterprise licenses. Pricing for Enterprise Server licenses starts at €1500/ month for 400 concurrent users with no limits on the amount of Account Holders or Moderators you register on the platform making it a very competitive offering. Licenses can be extended to larger numbers of concurrent users and through add-ons such as mobile applications, white-labeling, dial-in bridge, edge servers and more. For single accounts on the OnSync cloud, Digital Samba offers a 30-day free trial on all of their plans. They offer 5 packages on a sliding scale. The ‘Starter’ package costs €29 and is for 5 concurrent users, 100 MB file space, and 5 recordings. The ‘Easy’ package costs €49 for 15 concurrent users with 200 MB file space and 15 recordings. The ‘Pro’ plan costs €75 for 50 concurrent users with 500 MB file space, 50 recordings, custom branding, API and, Dial-in features. The ‘Hi-Def’ package costs €149 for 100 concurrent users, 750 MB file space, 100 recordings, video calls, custom branding, API, and Dial-in features. The last package is the ‘Events’ package and costs €299 for 200 concurrent users with 1 GB file space, 200 recordings, video calls, custom branding, API, and Dial-in features. A 500 user package called ‘Power’ is also available on request, it is not listed on the website. OnSync uses dual level independent security protocols to ensure all communications are completely secure. Users have to authenticate themselves prior to establishing connection, and their location is also verified in order to ensure that access is from authorized sources only. Only once the application connection to the server has been verified does OnSync authorize your authentication credentials. None of the user’s data is cached. Additionally, during transmission of audio and video data, OnSync uses a proprietary protocol to automatically reduce security threats by using RTMP protocol by Adobe. Moreover, using RTMPS, streams are encrypted via SSL to 128 bit level. Custom authentication schemes validate the SSL connection prior to passing any data from the server to a client. Real time encryption is also provided, through use of the RTMPE protocol. This real time encryption thwarts third party applications attempting to “rip” the data from the transmitted streams, because only OnSync is able to decode the data transmitted from the server to the client. In addition to protecting your streams, all other file types users that move in and out of OnSync are protected by SSL encryption at all times. This provides the highest level of standard industry protection for your confidential data. Digital Samba offer a range of support channels, a rich knowledgebase, a user guide and YouTube video for self-help, or an online support ticket system and social media channels for direct support. This does fall a little short of the support we would expect for a service of this caliber. If you are looking for a full feature enterprise web conferencing server solution with the ability to white-label and run under your own brand name then OnSync is among the top choices. If features is a main priority in your web conferencing solution, then this is definitely a service to consider. With over 100 features including video, messaging and screen sharing, communication is a breeze. Additionally, the multiple security protocols for each aspect of the service ensures you have almost nothing to worry about in regard to the protection of your communication. This service is both innovative and extremely easy to use, and we are happy to recommend.